Un logiciel de sécurité qui protège votre PC des programmes malveillants et virus. L'offre gratuite du jour pour SecureAPlus Premium 4.5.2 était valable le 19 avril 2017! 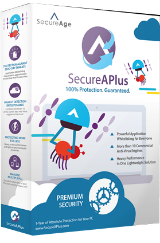 SecureAPlus est un logiciel de sécurité qui protège votre PC des programmes malveillants et virus avec son Application Whitelisting, puissant et facile à utiliser, et taux de détections fiables de plus de 10 moteurs Anti-virus cloud avec Universal AV. Il met à profit la puissance du cloud permettant l'utilisation faibles des ressources, et la compatibilité avec d'autres applications anti-virus et anti-malwares installés, ce qui rend une mise à niveau de securite parfaite pour tout PC Windows. Remarque: Le programme contient une licence Premium de 2-Ans. Thanks for this free licence today! I tried to scan a file (SM PLayer installer) online and and I had to wait a long time without the possibility to use windows explorer! And... There are really too much false positives! Great application for security! I installed it this morning and works well! :) Thanks for this free licence today! But... There's a big problem: I tried to scan a file (SM PLayer installer) online and and I had to wait a long time without the possibility to use windows explorer! And... There are really too much false positives! I've installed that program the last time it was given for free here, and I like it very much. However, there are some downsides. The confirmation windows pops up often, especially when the program has been recently installed. The server is very slow, and if you launch an exe that is not known yet by SecureAPlus from the Windows file explorer, and you decide to scan it online, you have to wait a while and during that time, the Windows explorer is blocked, and you cannot launch another exe. Also, as with all multi-engine scanners, false positives are frequent, because if only a single AV engine treats the exe as suspicious or PUA, SecureAPlus will issue the "thread detected" warning. IMO, there is room for improvement here. For example, it should be possible to define the number of AV engines that return a positive result before considering a file as dangerous. Anyway, even if the program is sometimes too intrusive or too slow, it is a valuable tool in your protection arsenal. I recommend to download and try it. I've installed that program the last time it was given for free here, and I like it very much. It doesn't interfere with your "normal" antivirus, and like VirusTotal, it uses several antivirus engines to verify if your files are secure, but unlike VirusTotal, it does it automatically and without any file size limit. (It can also use Jotti, but with some limitations.) However, there are some downsides. The confirmation windows pops up often, especially when the program has been recently installed. The server is very slow, and if you launch an exe that is not known yet by SecureAPlus from the Windows file explorer, and you decide to scan it online, you have to wait a while and during that time, the Windows explorer is blocked, and you cannot launch another exe. Also, as with all multi-engine scanners, false positives are frequent, because if only a single AV engine treats the exe as suspicious or PUA, SecureAPlus will issue the "thread detected" warning. IMO, there is room for improvement here. For example, it should be possible to define the number of AV engines that return a positive result before considering a file as dangerous. Anyway, even if the program is sometimes too intrusive or too slow, it is a valuable tool in your protection arsenal. I recommend to download and try it. Roland, Thanks for your feedback. This is much appreciated and helps us improve it further. We are aware of the server situation and have made some upgrades to meet the increasing demands as our userbase grows. Regarding having settings for the number of AVs before something is flagged, we will keep this in view. Our take on this is that no single AV is created equal and every single detection matters. This may indeed cause false positives but the idea is full disclosure and taking the full advantage of all those engines. It's a similar logic to how VirusTotal works where some of the lesser known/trusted engines that detect a potential threat are mostly ignored, only in our case you get that level of protection in real-time rather than on-demand. The closest workaround we can suggest is to disable the engines that you do not trust and only leave the ones that you think are reliable - this should lessen the false positives while still taking advantage of more than one engine for real-time scanning and protection. Lastly, if you have an AV that you already trust, SecureAPlus works well with that too, simply disable the optional Offline AV. I hope that you found this helpful and that you take advantage of the promotion. Roland, Thanks for your feedback. This is much appreciated and helps us improve it further. We are aware of the server situation and have made some upgrades to meet the increasing demands as our userbase grows. Regarding having settings for the number of AVs before something is flagged, we will keep this in view. Our take on this is that no single AV is created equal and every single detection matters. This may indeed cause false positives but the idea is full disclosure and taking the full advantage of all those engines. It's a similar logic to how VirusTotal works where some of the lesser known/trusted engines that detect a potential threat are mostly ignored, only in our case you get that level of protection in real-time rather than on-demand. The closest workaround we can suggest is to disable the engines that you do not trust and only leave the ones that you think are reliable - this should lessen the false positives while still taking advantage of more than one engine for real-time scanning and protection. Lastly, if you have an AV that you already trust, SecureAPlus works well with that too, simply disable the optional Offline AV. I hope that you found this helpful and that you take advantage of the promotion. I'm tempted to try your software, but am a bit confused: I see on the Giveaway page that you're including a 2-year license, and on your website, the software is totally free but with only a 1-year license. Is this the only difference? You list the package as a $45.00 value, so is that the renewal price at the expiration of the 1-year (or 2-year) licenses? What piques my interest is the ransomware protection. I hope that this was helpful. Enjoy! Jerry Guinn, You're getting the Premium which has additional features for management of multiple PCs. The good thing about this giveaway is that you can claim it with as many PCs that you have and link it to a single account. For a better understanding of the Premium features you can check out the page below: https://www.secureaplus.com/features/premium/ I hope that this was helpful. Enjoy! Right after the initial scan ended 100% I still get "server is processing your request. Please wait" and at some point "Error retrieving results". I also noticed SecureAplus disabled my antivirus during setup without asking me .So I had to disable the offline antivirus of SecureAplus (in app settings-scan settings) to make it active again. @SecureAPlus Right after the initial scan ended 100% I still get "server is processing your request. Please wait" and at some point "Error retrieving results". What's happening? I also noticed SecureAplus disabled my antivirus during setup without asking me .So I had to disable the offline antivirus of SecureAplus (in app settings-scan settings) to make it active again.